Borche Naumoski graduated from the Faculty of Music, Ss.Cyril and Methodius University in Skopje, classical guitar study program, in the class of Professor Vojislav Ivanovikj in 2006. Following his graduation, he enrolled in the second cycle of studies under the mentorship of Professor Srgjan Toshikj at the Faculty of Music in Belgrade, University of Belgrade. He defended his master thesis on guitar performance in 2010, thus obtaining the professional title Master in Guitar Performance. His successful career in guitar performance comprises of number of solo concerts and recitals in the Republic of Macedonia, some of which have taken place at the Youth Cultural Centre, Daut Pasha Hamam, Grigor Prlichev Memorial House and the Museum of the City of Skopje. His repertoire covers pieces composed over different periods, starting from the renaissance up to the twentieth century. Both as a performer, and as a jury member he has taken part in the most important music festivals in the Republic of Macedonia and the Republic of Bulgaria, such as Tremolo Guitar Festival, Skopje Guitar Festival, Golden Lira, Kystendil guitar fest and others. Mr. Naumoski works as a pedagogue with pupils and students. He is a Docent at the Faculty of Music, Ss Cyril and Methodius University in Skopje, teaching Guitar, Chamber Music and Guitar Literature. He is also a guitar teacher at DMBUC Ilija Nikolovski – Luj in Skopje. Sandra Krstevska (first violin) graduated from the Faculty of Music Art in Skopje, in the class of Professor Ljubisha Kirovski. She is a member of several chamber ensembles in collaboration with renowned artists and as of 2016 she works as an external member of the orchestra of the Macedonian Opera and Ballet.She works as violin professor at DMBUC “Ilija Nikolovski – Luj”. Jelena Tufekchievska (second violin) graduated from the Faculty of Music Art in Skopje, in the class of Professor Oleg Kondratenko. From 2002 until 2006 she was a member of the orchestra of the Macedonian Opera and Ballet. She works as a professor of violin at DMBUC “Ilija Nikolovski – Luj”. Tanja Trifunova (viola) graduated from the Faculty of Music in Skopje, in the class of Professor Ljupco Gospodinov. She isa member of couple of compositions such as the orchestra for film music “FAMES”.She works at the Macedonian Opera and Ballet Orchestra. Ljupka Kaevikj (cello) graduated from the Faculty of Music in Shtip, in the class of Professor Paskal Krapovski.From 2015 until 2017 she works as cello professor at DMBUC “Ilija Nikolovski – Luj”. Sheworks as an external collaborator in the at the Macedonian Philharmonic Orchestra. She has attended several seminars of renowned professors. The String Quartet “Passions”, composed of Sandra Krstevska, Jelena Tufekcievska, Tanja Trifunova and Ljupka Kaevikj, was formed in 2016 for the purpose of cherishing the music from the period of classicism. The first performance of the Passion is Quartet collaborated in 2016 with the guitarist Borche Naumoski, performing the concert for guitar and string quartet Op. 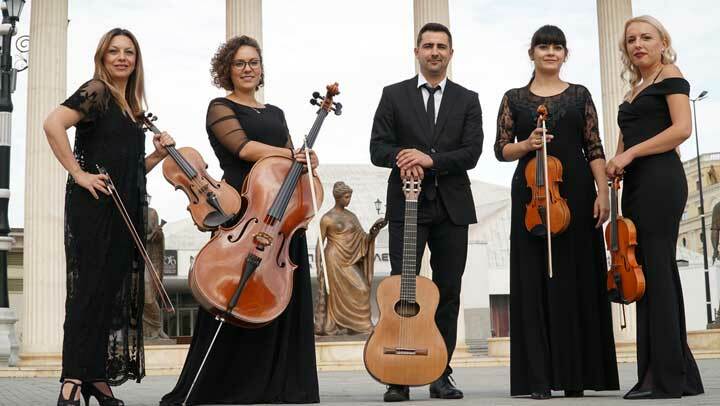 30 in A Major by Mauro Giuliani, and their collaboration continued in the following years with performances of concerts for guitar and string quartet. During the concert at Gallery MC in New York which will take place in December 16th, 2018 they will perform two concerts by the Italian composers Mauro Giuliani concert Op.30 in A-Major and concert Op.140 in E-Minor by Ferdinando Carulli.